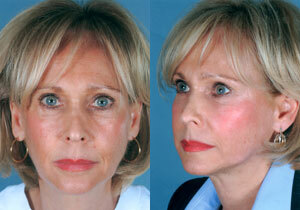 Less Pain Equals More Gain With Adult Stem Cell Facelift! Work is underway at the Giampapa Institute for Anti-Aging Medical Therapy in Montclair, NJ to gain patent protection for a procedure that enables a knife-free facelift - injections with one's own adult stem cells. The patent application was filed last week by NeoStem, Inc. for the technology which integrates NeoStem's proprietary stem cell extraction process. Giampappa's stem cell facelift not only lifts, but reduces wrinkles, thereby reducing the need for costly and painful injections of facial fillers. Your own stem cells are separated from fat withdrawals, mostly from your lower abdominal area, and then only the stem cells are injected into facial areas. These stem cells encourage the skin to generate its own stem cells, so the results start immediately, and you get the benefits of a firm face and younger skin. Giampappa's technique requires just local anesthetics, and it only takes about about a week for patients to face the world again with a bit of makeup. In this case less pain equals more gain! The Institute for Anti-Aging Medical Therapy has also become a repository of adult stem cells from all sources (e.g., fat, bone marrow, etc.) for NeoStem, that can be banked and stored for later use in one's medical treatments -- bio-insurance. NeoStem is building its network of such stem cell storage units at U.S. medical facilities, and is embarking on international agreements as well. It has been active in assisting medical centers in experimentation of adult stem cell use for a variety of procedures, including assisting the U.S. Department of Defence in evaluating stem cell use to treat service wounds.